As this new simplified simulation illustrates, Ebola may kill more than other diseases, but it spreads much slower. The simulation, which appears at the Washington Post, shows how quickly 10 diseases, ranked from most to least fatal, could spread from one person to 100 unvaccinated people. Ebola, with a death rate of 70% is clearly the deadliest, with Smallpox (30%), Measles (25%) and SARS (11%) right behind. But the rates of spread are dramatically different. Take the flu, for example. The simulation hit 100 infections after only 12 days. For Ebola, it took 71 days to reach 100. Indeed, diseases require a certain amount of time to pass from one infected person to the next group of people, which is called a "generation." So, if Ebola were as easy to catch as chicken pox, then thousands of people would have been sickened by the fourth generation. Disease estimations rarely have precise, neat numbers. One outbreak may spread more quickly or kill a higher percentage of people than another. So our models run different scenarios based on ranges provided to us by mathematical epidemiologist Gerardo Chowell of Arizona State University. Each sample of 100 starts with a "Patient 0," the first person to get sick. After that, each simulation may differ in the number of days before the next group of people becomes ill, the number of people in that group, and the percentage of them who die. How quickly will it spread? How many people will it kill? 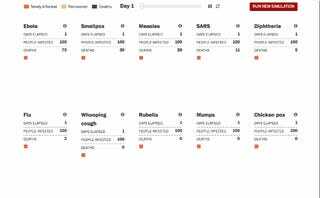 In turn, these models help public health officials develop strategies to attack specific outbreaks. You can run the simulation yourself here. And be sure to check out the Post's comprehensive coverage here: "The ominous math of the Ebola epidemic."